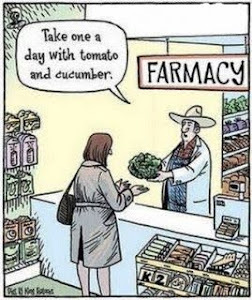 ...and let medicine be thy food!" Hippocrates was on to something! I never could have imagined authoring a blog devoted to Vegan, MSG/additive-free eating, or quote the man who viewed food as medicine oh so long ago. Yet, here I am! My journey to healthier eating started a few years ago when I discovered that I suffered from severe adverse reactions to foods containing MSG (Monosodium Glutamate). Certain meals would leave me feeling spaced out and dizzy with an upset stomach, always followed by a massive headache. I thought that if I just eliminated foods containing the ingredient "Monosodium Glutamate", I would be okay. However, further research revealed that MSG is hidden in most food under various, different names. (Click here to read my "MSG Facts" entry). I clearly remember the day I re-vamped the cupboards, getting rid of everything containing MSG or one of its alternate names. The cupboards were left bare. For the first time I started seeking out organic, all natural alternatives to the things I used to eat. If a food product contained an ingredient that I was not familiar with or couldn't pronounce, I wouldn't buy it, let alone eat it. Every ingredient I came across was thoroughly researched. I needed to know what I was putting in my body to avoid the potential of getting sick again. Slowly but surely my cupboard overhaul was complete and I was on my way! I started watching documentaries on healthy eating, ones I highly recommend such as Food, Inc., The Beautiful Truth, The Gerson Miracle, and most recently Fat, Sick & Nearly Dead and Forks Over Knives. These documentaries further confirmed the dangers MSG and other additives/preservatives in our food. They also opened my eyes to the cruelties of factory farming, and to the antibiotics, hormones and steroids being injected into the animals I used to eat. Not to mention the genetically modified diet said animals are being fed before their slaughter, which makes its way into the human body after its ingestion. They also introduced me to The Gerson Therapy, an alternative nutritional treatment for cancer, chronic illnesses and degenerative diseases based upon a plant based diet and fresh pressed juice. (Click here for my post expanding upon the Gerson Therapy). As a result, I became a vegetarian in October of 2010, and not long after, purchased a Green-Star juicer, otherwise known as "my best purchase of 2011". So, on top of my re-vamped, additive-free eating, I eliminated meat/chicken/fish and started juicing 1-3 times per day. So, how exactly has food been my medicine, and why would I put my faith in nutrition over medicine any day of the week? Prior to to my dietary changes I used to suffer not only from my MSG reactions, but also from hypoglycemia (MSG stimulates the glutamate receptors in the pancreas causing a constant release of insulin resulting in low blood sugar) and swollen, painful joints in my hands. Today I'm no longer sick and spaced out after a meal (unless I accidentally ingest something with MSG), my low blood sugar is non-existent and my joints are no longer swollen or painful. I've been much healthier with less colds and tons of more energy too! I'm not completely opposed to modern medicine, but I firmly believe that as a society, we are over-medicated for conditions that can be reversed and/or cured by simple, dietary changes. We look to medication first, which only masks the symptoms of what's really wrong. Why not look deeper and treat the cause? If you're visiting this blog because you're interested in additive-free eating, or just learning more about it, I hope that you find the information and recipes I post useful and thought-provoking. I look forward to sharing recipes and more of what I've learned about healthy eating, as well as learning from others!